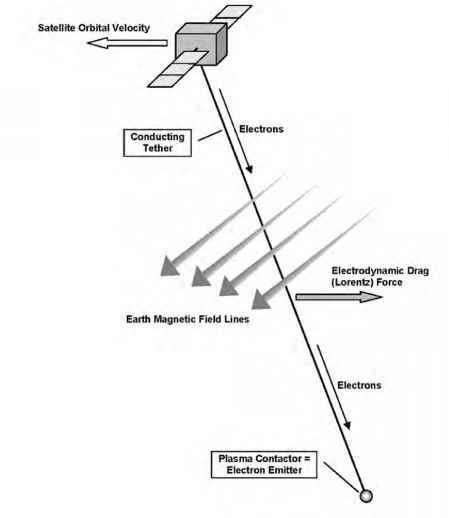 As explained in Chapter 1 (see Momentum Exchange), the difference in gravity at different altitudes above Earth can be used to stabilize two tethered satellites into a vertical position. This was first demonstrated by the Gemini 12 mission and SEDS-2, although not without difficulty (see Chapter 4, sections Gemini 12 and Satellite Experiments). Such gravity-gradient stabilization does not necessarily require a tether; all that is needed is a spread of mass over a sufficient length—in other words, an elongated spacecraft shape, such as has already been employed by several small satellites that had long poles, called "gravity booms,'' attached instead of active onboard attitude control systems. Such poles create a gravity-gradient effect that is relatively weak but sufficient to stabilize small, low-mass satellites that do not have very accurate attitude control needs or pointing requirements. However, for large satellites such poles need to be so long that they are hard to fit inside a launcher's nose cone, and they also make a spacecraft relatively heavy. For example, in the late 1960s NASA launched a series of experimental, geosynchronous applications technology satellites (ATSs), of which ATS-2, ATS-4, and ATS-5 were equipped with extendable booms to test gravity-gradient stabilization. These barrel-shaped ATS spacecraft each had a mass of about 320 kg (700 pounds) and needed 30-meter (100-feet) poles to maintain their attitude. Most modern operational satellites have much higher masses and would therefore need to have much longer and heavier booms that would be hard to launch even in a folded or telescoped configuration. For such satellites a deployable tether with a mass at the end could be used instead. Tethers can be rolled up for launch, resulting in compact payload packages that can fit inside the fairing of a rocket. Furthermore, long cables mean stronger gravity-gradient effects and thus more steady and robust stabilization. The Smithsonian Astrophysical Observatory and the Italian space industry Alenia Spazio have studied the concept of using a long tether to stabilize a large space station for NASA. The ISS that is currently in orbit has a complicated configuration consisting of various modules and large solar arrays. Docking and undocking spacecraft, of which the Space Shuttle is the largest, have important and sudden effects on the position of the center of mass and the stabilization of the station. The ISS therefore requires a sophisticated attitude control system to ensure that the station always maintains the right attitude with respect to the Sun and Earth, primarily to guarantee the proper orientation of its solar arrays. If this control system suffered a malfunction, the station could quickly lose its correct orientation. This could make it impossible to point the solar arrays to the sun, resulting in an electrical energy shortage. An erratically moving station would also be very hard to dock to for any visiting spacecraft with vital supplies. A deployable 6-km (3.7-mile) tether with a ballast mass of about 1400 kg (3100 pounds) could be reeled out to provide emergency attitude stabilization using gravity-gradient forces. The study listed as the main benefits of this system its simplicity, relatively low cost, and reusability; when the main attitude control system would be back in operation, the tether could be reeled in to be ready for use another time. The tether could also be permanently deployed to alleviate the requirements for the other attitude control system elements. The attitude tether stabilizer was not implemented on the ISS, which now has an attitude control system that consists of large gyroscopic wheels and a backup system with reaction control thrusters. The risk that an uncontrolled cable could wrap itself around the station and hinder the function of vital equipment (such as solar arrays and docking ports) has probably played an important role in the decision not to implement a tether system on the ISS.